EDIT: Today feels like one'oh'dem good days. 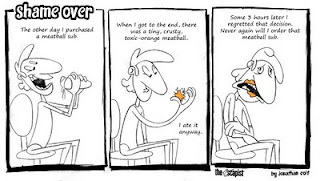 I have decided to post one of the little comic strips which I submitted to The Escapist (host of Zero Punctuation videos) to try and become their regular webcomics guy. They are having a competition for the position. Go check it out! If I fail miserably I will post the rest here, and probably continue the series right on my blog until I get bored of doing it. Enjoy. EDITx2: If anyone is noticing the videos are down, it is Blogger. I am in the process of updating everything over to vimeo now. Thanks for everyone who has brought this issue to my attention. 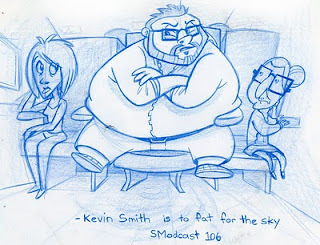 Not sure if anyone who follows me follows the work of Mr.Kevin Smith but if you are not a fan, Kevin Smith is the director of Clerks (among other movies) and has recently found himself in a debacle with Southwest Airlines who claim he is to fat to fly. It was the recent topic of discussion on Kevin Smith's weekly podcast (SModcast) which is available here. A forum which deals around SModcast related art is available and I decided to share this piece. Enjoy. Oh yeah, one last thing: film making is one hell of a process. 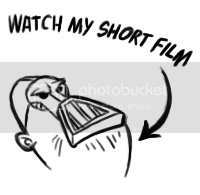 This is my animation at nearly 50% complete though it really doesn't seem that way because many of the bigger more animation-heavy scenes are the ones still in limbo. I unfortunately have a lot of timing and composition issues from scene to scene which I will have to tackle soon. Right now if feels paced so fast that you can hardly follow it. I will add some breathing time.